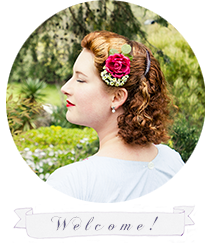 The lovely and inspiring Joanna from Dividing Vintage Moments is holding an amazing giveaway and is asking us all what inspires our vintage journey. So I am going to write a list of ten things that have helped me on my way to fabulous vintage frocks and fun. Yeah, this will be on everyone’s list I am sure, but honestly, isn’t it the universal reason for wanting to wear vintage is so that we can prance around in pretty dresses and feel so wonderfully feminine? I remember the first blog I started following - The Clothes Horse. That was the beginning of the end, as they say. I studied Journalism, and in 2007 was introduced to blogging. I kept a blog since then, but it was more of a personal dairy. When I saw The Clothes Horse blog in 2010 I suddenly found a whole world of blogging I had no idea existed and from there it was step, by step, blog by blog, and I found myself in the world of vintage blogging via Dairy of a Vintage Girl. Before the dresses, before the heels, before the blogging, there was… books. Lots and lots of books. Books were the first thing I collected, the first thing were I was all like “old school is way better than anything modern”, the first thing I thrifted, and the first thing that I nicked off my mum when I decided that I wanted all her old stuff. I love old furniture and it’s lured me in to the world of things that are finely crafted by artisans who cared about their work, creating pieces that would last longer than a lifetime. History means so much to me – stories and the tales of people’s lives. I really like studying the past, and of course, the writer in me is fascinated with the details. Ok, so its not really treasure, but we all know the thrill of finding the perfect piece of vintage hiding under the pile of 70’s polyester, or buried under all the dust. There’s nothing like the adrenalin rush of that perfect find. Old vintage china is one of my favorite collectables, and I love sipping a steaming hot brew from a delicate teacup, accompanied by a good old fashioned morning tea of hot scones and cream. Puffy petticoats and a twirl-y circle skirt? One word - love! I love the muted tones, jewel shades and pastel color palettes of the older eras. Of course, color palettes recycle, just like styles come around, but in my mind, you just can’t beat the original inspiration. This was such a splendidly enjoyable read - which I found myself nodding in agreement all the way through. I love that you included things such as books and treasure hunting, as they were some of the first stepping stones towards my lifelong love of vintage, too.